Sideshow Collectibles is proud to present one of the Yautja's most versatile tools, the Predator 2 Life-Size Mask Prop Replica. 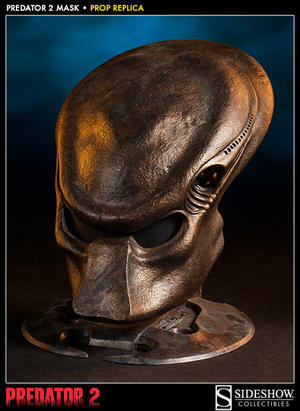 With capabilities ranging from multi-spectrum tracking and stealth cloaking to voice mimicry, the advanced technology of the Predator's Bio-Mask helps them hunt efficiently and capture their prized prey. This expertly crafted reproduction has been individually hand-painted and features a brilliant LED light-up red tri-laser target designator. 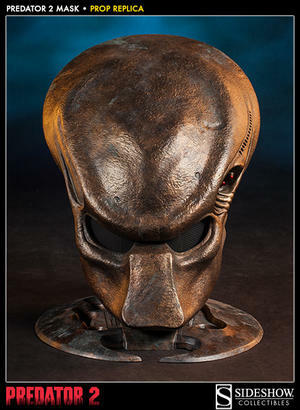 Artfully displayed upon a Smart-Disc weapon base, the Predator 2 Life-Size Mask Prop Replica is the perfect trophy for any Predator legacy display! Please note: Not intended as a costume piece. Masks are to be worn by PREDATORS, not people.